We have provided very simple and easily worded speech on ‘Swachh Bharat Abhiyan’ or ‘Swachh Bharat Campaign’. It is a ‘Clean India’ drive run by the government since 2014 to make India a clean India. 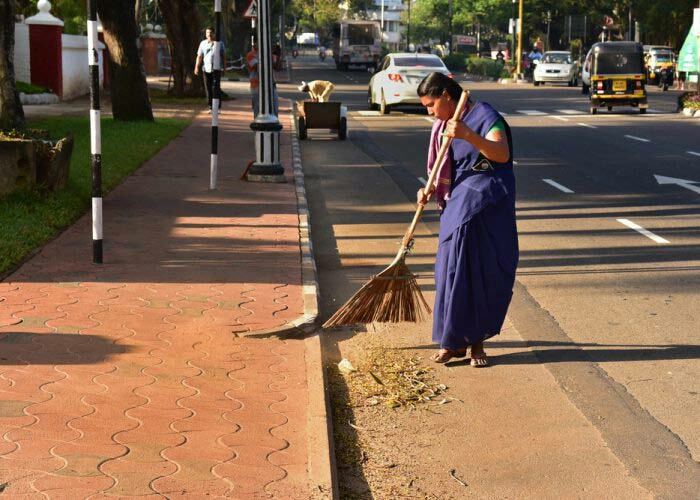 Cleanliness is a major social issue in India and this campaign deals with how to solve the problems arisen due to the lack of cleanliness in India. Dear students, you are at right place, use any of the Swachh Bharat Abhiyan speech given below according to your need and choice to participate in the cleanliness drive of India. Being the future of the country, you can lead the ‘Clean India Campaign’ in your society, community, schools or colleges to initiate cleanliness in the surrounding areas and make this drive a successful campaign. Good morning to all. My name is …… and I study in the class…. As we have gathered here on this great occasion, I want to say something in my own words in front of this big crowd about the Swachh Bharat Abhiyan. I especially chose this topic because of the increasing need of the cleanness all around the India which can only be done by the support of each and every citizen of the country. The great person of India, Mahatma Gandhi had said that, “Sanitation is more important than Independence”. India is still a developing country because of the poverty, lack of education, lack of cleanliness and other social issues. We need to eliminate all the bad reasons from the society causing obstruction in the growth and development of our country. Mahatma Gandhi was well aware of the weakness of the Indian rural people during his time of Indian Independence Movement. He dreamt of making this country a clean country and even he had emphasized a lot by many means among rural people however could not complete because of the incomplete participation of the people. After many years of independence, we are still living in the dirty environment and putting our lives in danger every moment. According to a report, around 30% of the rural people do not have safe access to the toilets and use open defecation system in the fields. The Former Indian President, Mr. Pranab Mukherjee said while addressing to the Parliament in June 2014 that “For ensuring hygiene, waste management and sanitation across the nation a ‘Swachh Bharat Mission’ will be launched. This will be our tribute to Mahatma Gandhi on his 150th birth anniversary to be celebrated in the year 2019”. In order to ensure the hygiene all over the country, it is very necessary to solve the problems of sanitation, safe toilet, and proper waste management. The Prime Minister of India, Narendra Modi has emphasized people about ‘Clean India’ during his speech on August 15, 2014 on the Indian Independence day however the mission was launched successfully on 2nd of October in 2014. This mission has targeted its completion till 2019, the 150th birth anniversary of Bapu. This mission targets to fulfill the sanitation facilities to all as well as eliminate all the unhealthy practices of people by 2019. It was 25th of September 2014 when the first cleanliness drive was started by the Indian Prime Minister. It is counted as a major awareness campaign in India which became viral. Proper hygiene and cleanliness has the capability to change the global perception about India and can attract more tourists every year which in turn will increase economy of India to a great level. According to this campaign, every Indian citizen has been requested to devote their 100 hours annually for cleanliness in India. There is also a norm to make separate toilets for boys and girls in each and every schools and colleges all over India for the safety and hygiene of the students. As a student and most importantly an Indian citizen, I too request all the people gathered here to participate in this mission to compete it by 2019. Good morning to the respected Principal, teachers and my colleagues. My name is……, I study in class…. First of all I would like say a big thank to my class teacher to give me some time on this great occasion to give my opinion on the big campaign of Swachh Bharat Abhiyan in front of you all. It is said that youths of the country are the future of the country. So, as being a citizen, student, and a youth of the country I have understood my responsibility for the country’s development and chosen this topic to improve the awareness about this mission among people of India. This mission is also called as the ‘Clean India Mission’ or ‘Clean India Campaign’. It is a major national campaign started by the Indian Government in 2014 on 2nd of October. The date of launch of this campaign was chosen 2nd of October which is the birth anniversary of Mahatma Gandhi because it was the dream of Bapu to make India a clean India. The campaign of clean India was officially launched at Rajghat, New Delhi by the Prime Minister Narendra Modi after cleaning the streets by himself. This mission is the biggest ever cleanliness drive when approximately 3 million government employees including school and college students took part in the event. The Indian Prime Minister initially nominated nine famous personalities of the India while launching the campaign to initiate this campaign in their own regions as well as bring fluency in the drive. He also requested all those nine personalities to call another nine people to continue this chain (like a branching of a tree) until each and every Indian gets involved in the mission because it has to be completed till 2019, the 150th birth anniversary of Mahatma Gandhi. This mission aims to make the availability of the individual sanitary latrines, converting dry latrines into low-cost sanitary latrines, hand pump, proper bathing, sanitation, set up of sanitary marts, drains, soakage pits, solid and liquid waste disposal, increase people awareness about health and hygiene, maintain environmental and personal hygiene etc. Earlier to this mission in 1999 on 1st April, the Government of India has implemented the sanitation programmes called ‘Total Sanitation Campaign’ (TSC) however it was not so effective even after the launch of incentive scheme called Nirmal Gram Puraskar in order to boost the TSC. Later, on 1st April in 2012, the same programme was renamed as Nirmal Bharat Abhiyan (SBA) and finally it was re-launched as Swachh Bharat Abhiyan on 2nd of October in 2014. The main objective of this campaign is to achieve the vision of a ‘Clean India’ by 2019, 2nd of October (150th birth anniversary of Mahatma Gandhi). This mission has been declared by the Indian government as “beyond politics” and “inspired by patriotism” to give its credit to all citizens of India. Some other specific objectives are complete elimination of open defecation in every area, eradication of manual scavenging, promotion of reuse and recycling of municipal solid wastes, bring behavioural changes to people regarding hygiene and health, link it to public health and facilitate private-sectors to hugely participate in this mission for capital expenditure and maintenance. Good morning to my respected Principal and teachers. I…… study in class…… want to give my opinion over the ‘Swachh Bharat Abhiyan’ in front of all of you at this special occasion. I have especially chosen this topic to be part of the campaign and increase its awareness among public. ‘Swachh Bharat Mission’ is a big campaign ever in India because around 3 million government employees and students have taken part on the day of its launch. This mission seeks the active participation of the people of any age group from all corners of the country and has to be completed till 2019, 2nd of October, the 150th birth anniversary of the Mahatma Gandhi. This campaign was especially launched on 2nd of October in 2014 (145th birth anniversary of the Mahatma Gandhi) to fulfill the vision of ‘Clean India’ of Mahatma Gandhi. Mahatma Gandhi had dreamt of clean India and said that, “Sanitation is more important than Independence”. According to the data of 2011 census, it was estimated that only 32.70% of the total rural population has access to the toilets. According to a UN report, India is a country where largest number of people in the world use open defecation system. However after the launch of this campaign the figures have drastically changed. As of November 2018, now 96.55% of the total rural population has access to the toilets and more than 5 lakhs villages have been already made open defecation free. The nationwide cleanliness campaign of the Prime Minister Narendra Modi ‘Swachh Bharat Mission’ was started from the Valmiki Basti in New Delhi. He had requested the 1.25 billion people of India to join the campaign while addressing the nation on the day of launch. Swachh Bharat Abhiyan has following objectives: to make availability of individual toilets, eliminate open defecation, enhance public awareness for cleanliness, promote the use of latrine among common public, promote behavioural changes, keep villages clean, proper disposal of solid and liquid wastes, set up water pipelines in villages, ensure water supply etc. This mission is the ultimate goal to make our country a clean and developed country forever having clean and happy citizens. My name is……, I study in class……. First of all I would like to say good morning to the respected teachers. I am very grateful to my class teacher that she trusted me and gave me a chance to show my talent of speech in front of you. I have selected the topic of Swachh Bharat Mission, a Clean India Campaign because of its necessity and a big responsibility for all of us. It is a mass movement started by the government to make India, a Clean India by 2019. Mahatma Gandhi, who is also known as Bapu or father of the nation, has always emphasized people on ‘swachhta’ for their healthy and prosperous life however it could not become so effective because of very less co-operation from the people. Cleanliness is not limited to any person or place; it is the responsibility of everyone to clean themselves as well as their surroundings to really make India a clean India in near future. It is the combined responsibility of 1.2 billion people living in the country. In order to make this campaign an effective and successful mission, Indian Prime Minister has planned to make a chain of nine people. On the day of launch of mission, PM nominated nine Indian personalities to involve in the mission in their own areas in order to initiate this campaign. He also requested them to again nominate another nine people to join the campaign to continue this chain till the message of campaign reaches to everyone in all corners of country. The aim of this campaign is to maintain cleanliness and hygiene in each and every corner by completely eliminating the open defecation in country. The maintenance of cleanliness and hygiene in India would bring great opportunity in country to enhance its economic status by improving the tourism sector to India as well as keeping its citizens healthy and happy. Cleanliness would keep everyone happy and healthy in all aspect whether physically, mentally, socially or intellectually by reducing the chance of diseases. Clean India, Disease Free and Economically Strong India.